Pot roasting is a slow cooking method that results in beautifully tender meat. Here beef silverside is cooked in a flavoursome sauce of ready-made beef consommé and red wine. Prepared in just 10 minutes, this pot roast makes an extra-special Sunday lunch. Preheat the oven to 170°C, gas mark 3. Heat the oil in a deep, flameproof casserole over a high heat, add the beef and fry for 1-2 minutes on each side until browned all over. Remove from the pan and set aside. Stir in the onion and red wine, using a wooden spoon to scrape up the sticky meat juices from the base of the dish, and cook until the wine has reduced by half. Return the beef to the pan, along with the courgettes, aubergine, leek and consommé. Cover with a lid or seal tightly with foil. Cook in the oven for 1 hour, then stir well and cover again. Cut the butternut squash in half, scoop out and discard the seeds. Wrap the squash halves individually in foil, place on a baking sheet and bake in the oven with the casserole for a further 1 hour, or until very tender. Using a slotted spoon, remove the beef and vegetables from the casserole and keep warm. Place the casserole on the hob and bring the cooking juices to the boil over a high heat. Cook until reduced by half, then season to taste. 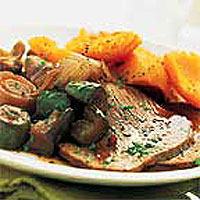 Return the vegetables to the sauce, then spoon onto serving plates and top with slices of beef and large scoops of butternut squash. Browning the beef in Step 1 seals in all the juices and flavours of the meat.